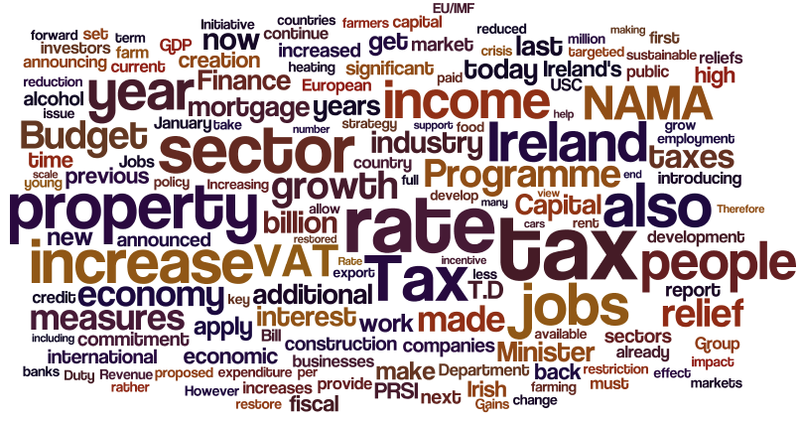 O’Leary Analytics has looked at the text of the Budget statement given by the Minister for Finance Mr Michael Noonan, TD on Tuesday 6th December 2011. The graphic below includes the 100 most commonly occurring words in the speech. The larger the word, the more often it occurred in the speech. Simply click on either image to view a larger version. By removing the two most commonly occurring words – Government and Per Cent – all of the other terms increase proportionally in size, giving a clearer picture of the words used in the speech.